Alcoholism and Psychiatry Research is an international peer reviewed journal, open to scientists and clinicians dealing with all basic and clinical studies of all disciplines relating to psychiatric illness or addiction, as well as normal human behaviour, including biological, environmental, psychological, social and epidemiological factors. The journal is available in microfilm from: ProQuest, Information and Learning, 300 North Zeeb Road, P.O. Box 1346, Ann Arbor, MI 48106-1346, USA. Phone: 7347614700; 800521 0600; Web: www.il.proquest.com. After a manuscript is accepted for publication, the authors must guarantee that all copyrights to the manuscript are transferred to Alcoholism and Psychiatry Research. 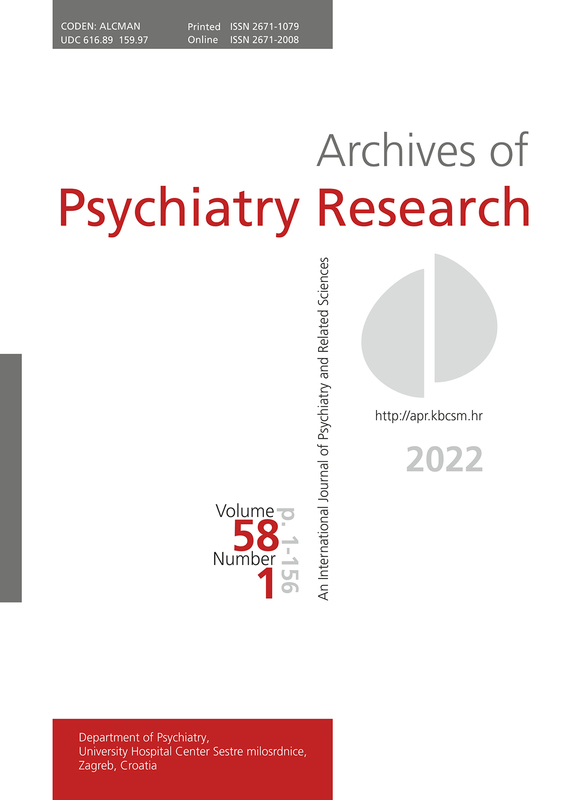 The publisher (Department of Psychiatry, University Hospital Center Sestre milosrdnice) has the right to reproduce and distribute the article in printed and electronic form without asking permission from authors. All manuscripts published on line are subject to Creative Commons Attribution License CC BY-NC-SA which permits users to read, download, copy, distribute, print, search, or link to the full texts of these articles in any medium or format. Also, users can remix, transform and build upon the material non-commercially, provided the original work is properly cited and any changes properly indicated. Complete legal background of license is available at: https://creativecommons.org/licenses/by-nc-sa/4.0/legalcode. The statements, opinions and data contained in this publication are solely those of the individual authors and contributions and not of the publisher and the editor(s). The appearance of advertisements in the journal is not a warranty, endorsement, or approval of the products or services advertised of their effectiveness, quality or safety. The publisher and the editor(s) disclaim responsibility for any injury to persons or property resulting from any ideas, methods, instructions or products referred to in the content or advertisements. The journal is published twice a year. Orders can be placed directly to the Editorial Office. The annual subscription is 30 EUR or equivalent in other currency. Payment by check at our foreign currency account, Hrvatska poštanska banka, Swift code HPBZHR2x (for Alcoholism and Psychiatric Research). The annual subscription in Croatia is 40 HRK to be paid to the account number HR31 2390 0011 1004 1610 4 (Hrvatska poštanska banka). Publishing of Alcoholism and Psychiatry Research is supported by the Ministry of Science, Education and Sport of the Republic of Croatia.